You'd think that a city such as Vancouver, being located on the West Coast, should be overloaded with places to enjoy seafood. Well, that is partly true. I'm not sure if we can include all the Chinese restaurants in town with "seafood" in their name because they are really a restaurant that happens to serve seafood (which probably is not Ocean-Wise). For me, Vancouver should have more places that serve exclusively seafood. 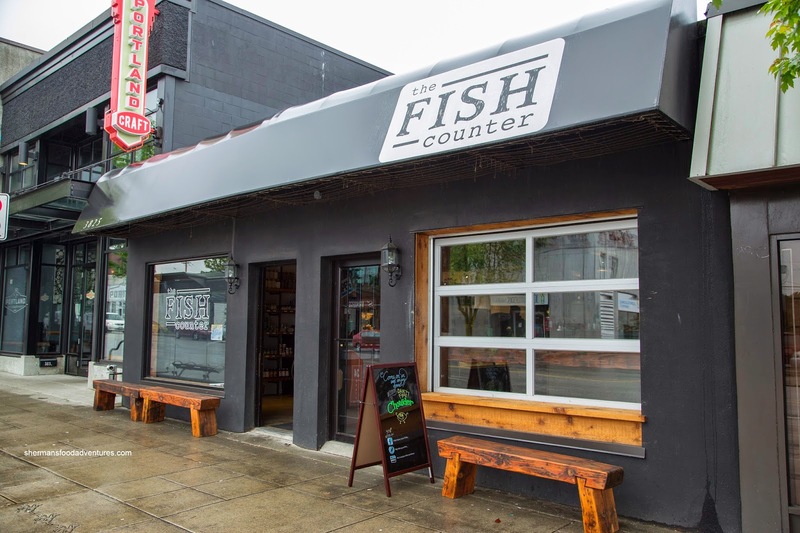 So when Chef Robert Clark teamed up with Mike McDermid to open up the Fish Counter (which is Ocean-Wise), I was chomping at the bit to go. And really, it isn't a restaurant per se, rather it's a fish market with a takeout counter. 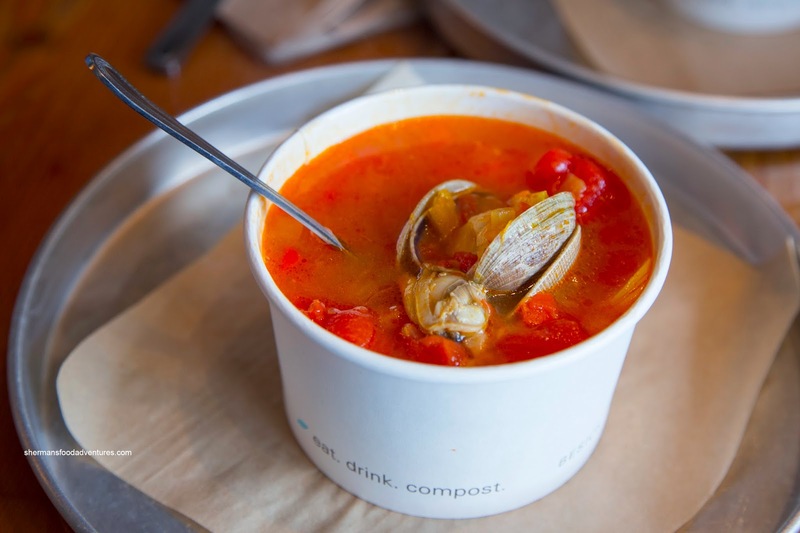 Viv and I were deciding whether to share a bowl of Clam Chowder or Seafood Bouillabaisse, so when it came time to order, I made the best decision possible - get both! I tried the chowder first and it was not made with cream, hence, it was less heavy and rich. Instead, it was only a lightly thickened broth that was definitely on the sweeter side (which was further enhanced by the corn). I really didn't get a significant clam hit even though there was plenty of it in the soup. In the end, the chowder was okay but really didn't hold a candle to the Bouillabaisse (for 95 cents more) as there was a bevy of halibut, salmon, mussels and clams. You can't see it in the picture, but it was a meal in itself. 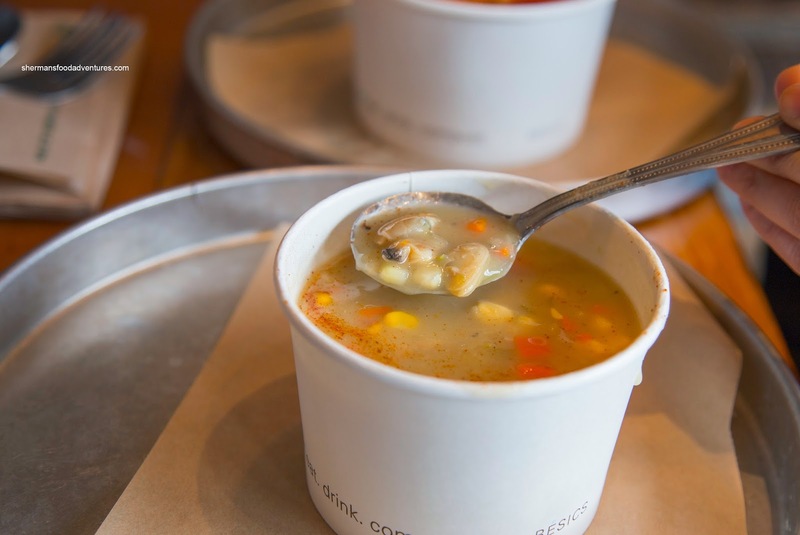 With a dollop of garlic puree and a noticeable amount of big slices of garlic, the broth was predictably garlicky. Combined with the sweetness of the tomatoes and fennel, this was good for $6.90. 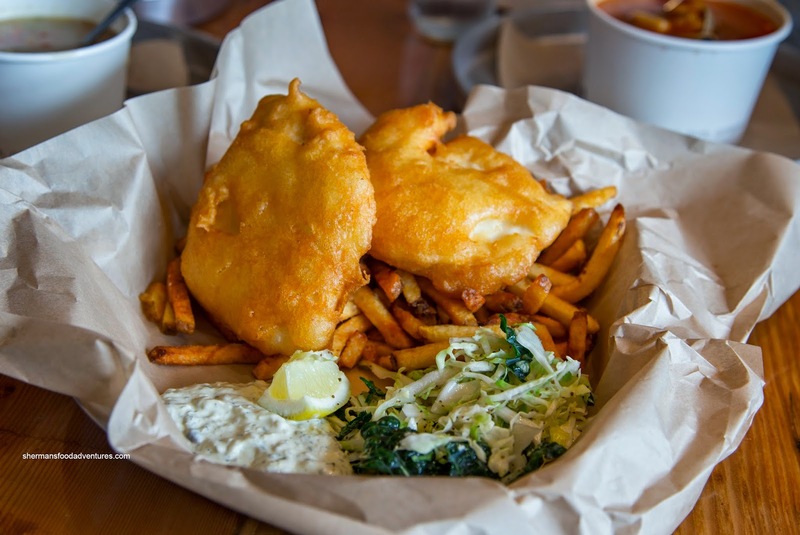 For our Fish n' Chips, we decided to do 1 piece each of halibut and Pacific cod. We found the batter to be really light and crispy. It was also easy on the grease. Both pieces of fish were just right being flaky and really moist. The accompanying tartar sauce had nice hits of dill and acidity while the kale coleslaw was sweet and tart. As for the fries, they were extremely crunchy with little potatoness left. 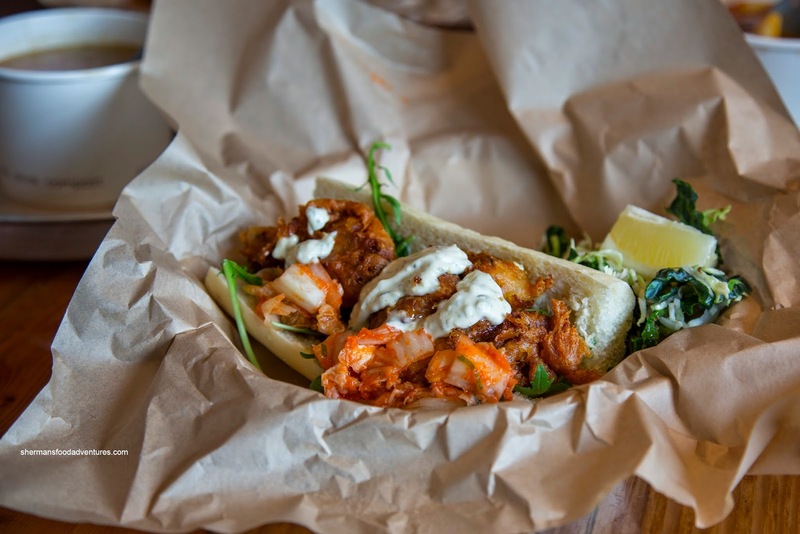 We also tried the Oyster Po' Boy with greens, spicy cabbage and tartar sauce. The 2 big oysters were fried beautifully where the outside was crisp while the inside was sweet and soft. The tartar sauce worked well with the spicy cabbage (kimchi-like), but the roll could've been toasted as it was cold and dense. For a takeout place, we thought that the food at The Fish Counter was pretty good. Of course, some things could've been better, but the overall experience was positive.